E-newsletter – April – 2015 - Bottom Line Underwriters, Inc. Does your dealership have a published mission statement? Can you recite it by heart? And does it represent your own business philosophy? Many of the stores I work with have their company mission statement prominently displayed for all to see. When I’ve asked about it, most of the dealers or general managers tell me that, generally speaking, their operations adhere very closely to that mission statement. When I ask the employees, however, some tell me they didn’t even know their dealership had a mission statement, and virtually all tell me that they had little if anything to do with the creation of that statement. 1) Our mission statement needs to be clear and understandable to everyone who reads it. 2) It needs to be brief enough for us to keep in mind. 3) Our statement needs to clearly define what client needs we are attempting to fill, who our clients are, and what resources we plan to employ. 4) It should focus primarily on a single thrust of effort. 5) It should reflect our personal distinctive competence. 6) Our mission statement needs to be broad enough to allow us flexibility in implementation but not so broad as to hinder our focus. 7) It should serve as a template and means by which we make our business decisions. 8) It MUST be consistent with our values, beliefs, and philosophy. 9) Our statement should reflect something attainable. 10) Our mission statement should be worded so as to serve as an energy source and rallying point for our careers. Once we’ve constructed our personal mission statement we need to memorize it, put it in our evidence manuals, include it in our marketing efforts to our clientele, place it on our business cards, share it with prospects, etc. Simply stated, we need to use it! Allow it to be one more tool we can use to distinguish and separate us from the average car salesperson. Next time you see me, ask me to share my personal mission statement with you. Just be prepared to share yours with me too! 1a. then we just go ahead and switch places halfway through the demo route. Next month’s objection will be: “I need my wife/husband.” We need YOUR input! Please forward your ideas on this one, or your suggestions on which objection to cover next, to editor@bluinc.com. “There are two things you must do to get anything in life you want,” my father would tell me. After turning 15 1/2, it became time to test this strategy out. The first part of the deal, I had already nailed; maintaining an A average throughout junior high school. This first condition, I must admit, was pretty easy to do. For years learning, and learning of any kind, had been my passion. So, long hours of study and excellent grades came fairly easily. The second part of the deal was going to prove to be a bit more challenging. I had to pay for the insurance and maintenance myself. If I couldn’t do that, then the car would sit. I had to get a job, quickly, and get a part time one that would pay enough to cover teenage insurance rates. There was a Super A grocery store at the corner of Mines and Rosemead, right down the street from where my family lived, that would do the trick. I had heard that a box boy (the early ’70s were less politically correct) could make good money and a clerk could make “killer bucks.” I decided to work there. Immediately after church, I rode my bike to the store, locked it up, and went in to scope things out. After watching the checkout stands for a few minutes, I asked to see the manager. Sonny had a quick gate, dark hair, brown eyes, a moustache, and was short, short in stature and short with me. “Sorry Pal,” he said, “We’ve got plenty of box boys already. I got no openings but check back with me later.” and he quickly walked away from me not even waiting to hear the witty and endearing reply I had rehearsed for just such an event. He didn’t smile, didn’t sugar coat it, didn’t even try to fake a look of empathy. I was sure he must have had something more important to attend to although I don’t think he realized that the issue before him was one of life or death. I left a little crest-fallen but still determined to work there. “The first thing you must do to get anything in life you want,” my dad would tell me, “is to ask. Ask, ask, ask, ask, ask, ask, ask, ask, ask, and always remember to ask again.” It was a strategy that consistently failed on him but always worked on my mother. Maybe it would work on Sonny. The next day, after school let out, I rode my bike back to the Super A. I found Sonny. I asked him for a job. He asked, “Didn’t I tell you I had no openings yesterday?” “Yes, sir.” I replied. “What makes you think anything’s changed, Son?” “I really need this job, Sir, and you did tell me to check back with you, so I am.” I replied. “Well, I still don’t need you. You can always check back with me though.” he said smiling at me. Then he turned and quickly walked away. I thought to myself that his tone had changed and he did call me Son, didn’t he? I left encouraged. The next day, same time, same question, similar reply. I came back the following day, same time, and asked again to be hired. Sonny again told me he had no openings. The day after that I returned to ask Sonny again for the job but he stopped me short. “Look, I admire your tenacity, Michael, but you have to stop asking me. No means no. Sorry.” He looked long and hard at me waiting for my reply. It didn’t come. I wasn’t prepared for that. He asked, “Okay?” still staring and frowning at me. I just stood there silent. Finally, I muttered a weak “But I really need this job, Sir.” “Sorry.” was all he said. “Okay, the two things I must do to get anything in life are to ask and take action,” I thought. “Asking’s getting me nowhere, what action can I take? What action can I take? What action…?” I took action. The young checker looked at me like I was crazy. So did her customer. But I just kept on bagging the groceries. I took care to follow what I had seen the “official” box boys do though I’m sure I was making some mistakes. I was going as fast as I could, smiling all the way. When one of the “officials” stepped in to finish the order, I simply found another checker who was “official- less” and started bagging their order. I did this for over two hours, and was getting better at it the whole time, until I finally had to leave in order to get home in time for dinner. I guess no one had complained, so Sonny never came to the front of the store to notice what I was doing. But I had my plan. Next day, I did the same thing right after school. This time I caught a little grief from one of the “officials.” His name was Dave. He was a lot bigger than me, I mean A LOT bigger. He had been boxing for over two years now, and was impatient about getting his promotion I later found out. He must have felt that I was treading on his turf and he made no effort to hide it. He asked menacingly, “What do you think you’re doing?” “Boxing groceries.” I said smiling. “Not here you’re not!” he snorted as he cut in front of me and pushed me out of the way with his backside. The checker pretended not to notice and the customer didn’t know what to make of it. I just moved to another check stand. Dave made it a point, after finishing each of his orders, to find me and either verbally or physically move me out of my plan of action. All the other box boys either ignored me altogether or adopted Dave’s tactics although none of them were physical with me. I eventually became discouraged and actually was afraid I might start crying. It looked like I’d have to come up with another plan. Just in time, one checker very sweetly said to me, “Over here, Honey, you can bag for me.” Her name was Helen. She was a small woman, perhaps in her late 30’s or early 40’s, neatly kept, with a motherly look and presence. She was the senior checker so no one messed with me. She asked me what I was trying to do. I told her my plan. I was going to keep bagging until Sonny gave me the job. She smiled and said that Sonny can sometimes be a hard man but either way, I could bag for her. I also found out that it was Sonny’s day off, but I was committed to my plan of action and besides I enjoyed Helen’s company. I stayed and boxed for Helen until my dinner time. The following day was Saturday. I was there right when the store opened. I found my place at the back of Helen’s check stand. Several hours had gone by with Sonny watching what I was doing and acting as if he wasn’t watching or at least didn’t notice it was me. Both Helen and I would engage each customer in friendly conversation as we quickly and efficiently totaled and bagged their groceries. With Helen’s coaching, I was getting real good at boxing. This was fun! I almost forgot I wasn’t getting paid for it. That is until Sonny finally approached me. He walked up to me when Helen didn’t have a customer and said, “I’m sorry, Michael, but you can’t do this any longer.” “And why not? !” That wasn’t my voice, it was Helen’s! She continued, “He’s not hurting anyone Sonny and besides he’s the best box boy we have here. Dave is always sulking around with a sour face because he keeps getting passed over, Teresa’s slower than Congress, Steve’s always late and if he does show up half the time he’s stoned, and Nicole’s only waiting for Hollywood to call!” Sonny couldn’t get a word in edgewise. Helen finished with, “Why don’t you just give him the darn job, Sonny? !” She stared down Sonny like she were his mother and Sonny just stood there frowning speechlessly. I got the job that day. Thanks to Helen, my dad, and the lesson he taught me. I worked hard, was always on time, was consistently friendly and polite, and quickly became the number one box boy in the eyes of the checkers. Helen and I became fast friends and she took pride in the way I attacked my duties, playfully reminding Sonny that I was her idea. Sonny quickly came around too and was generous with his praise and with my schedule. The other box boys warmed up to me also with the exception of Dave who never seemed able to change his sour demeanor. It took several stores and several times asking but I got my promotion that day. When I gave Sonny my two weeks notice the next day, he was shocked. He said he’d give me the promotion right now if I’d just agree to stay, but I had already given my new employer my word. Eventually, Sonny told me he was genuinely sorry to see me go and wished me luck. Over the years the “two things” strategy has proven to be more than reliable. It has become my battle cry, consistently reaping for me good fortune. As the years passed, long after I had moved on to other jobs and other industries, I would still occasionally drop by the Super A to say hello to my friends there. Sonny eventually moved on. Helen did too. But I think Dave might still be boxing there. 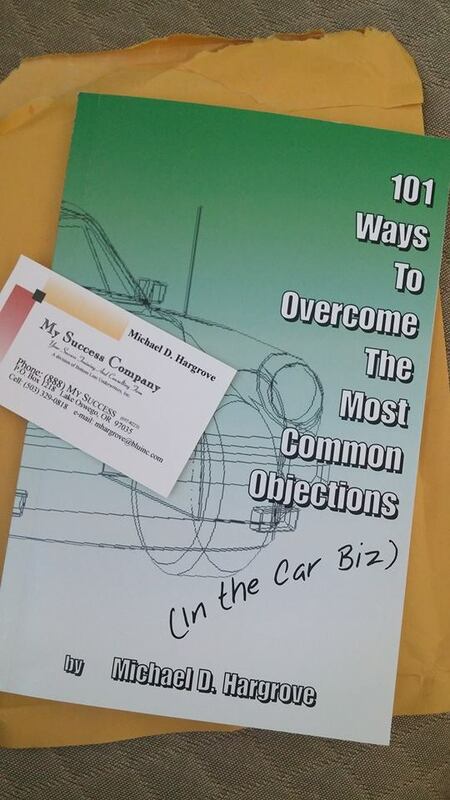 © Copyright 2013 by Michael D. Hargrove and Bottom Line Underwriters, Inc. All rights reserved. © 2015 by Bottom Line Underwriters, Inc. All rights reserved. Any unauthorized duplication or distribution is strictly forbidden by law. Besides think of all the bad karma you’d earn.